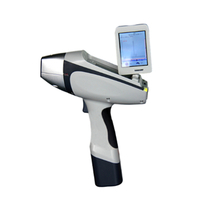 DSHG 9000 XRF Handheld Heavy Metal in Soil Analyzer - Buy Heavy Metal in Soil Analyzer, XRF Heavy Metal in Soil Analyzer, Top XRF Heavy Metal in Soil Analyzer Product on Dshing Instrument Co.,Ltd. DSHG 9000 XRF is designed for on-site analysis in the wild , featuring samll, light, precise, rapid, beautiful, safe, convenient, waterproof and long-standby time. Equiped with digital multi-channel technology, it greatly improves the detection limit and stability of the instrument, expanding the application fields. This product has passed strict testing and inspection, and all parameters are accorded with the related technological requirements, reaching the internation advanced level. DSHG 9000 XRF is applied for in-situ testing and repair analysis in soil pollution. It features the characteristics of samll & light body, which can be held in bands by common people when measuring. Simply trigger the instrument, and you will know the trace metal elements in soil. Can quickly on-site trace the pollution and circle the polluted boundary. The fourth generational handheld DSHG 9000 can circle the key pollution areas in very short time, for key management. Can rapidly distinguish the polluted areas and non-polluted areas. It improves the screening and productive rate integrally, and greatly reduces the cost of chemical examination and transportation. Small power intergral end-window miniature X-ray tube, large dimensional beryllium window Silicon Drift Detector(SDD, the best detector in the world), and miniature digital signal multi-channel processor, greatly reduce the testing time and testing deviation, and improve the testing time and testing deviation, and improve the testing precision, requiring similar performance as the desktop. Operation of on-site and in-situ detection at anytime or anywhere. 1-2secs for rapid detection, more than 10secs for precise detection, whose results are similar to the results gotten in lab. No destruction to samples. Helium-charging system(optional) greatly expands measurable range(analyze elements from Mg), satisfying the requirements of customers for light elements detection. It is equipped with professional soil analysis software. Combining FP with EC software, it is easy for operation and acquiring wider application fields. Built-in system, HD touch screen (resolution 640*480), digital multi-channel technology, and SPI data transmission technology, effectively accelerate the data transimission and improves the counting ability. Compliment away two Lithium batteries(78/00mAh), it can continously work for 8 hours all together. It is convenient for charging because of wide voltage AC charger and onboard charger. It can detect the elements such as Ti, V, Cr, Mn, Fe, Co, Ni, Cu, Zn, As, Se, Cd, Sb, Hg, Pb. And it can detect more elements according to the customer’s requirements.